"Our Lady of the Rocks"
There is a big brouhaha among two of the greatest museums in the world over what Leonardo da Vinci (painter of the “Mona Lisa” and “The Last Supper”) might or might not have painted five hundred years ago. 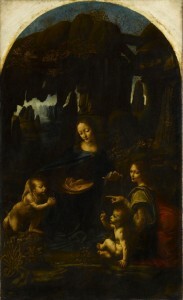 The National Gallery in London and the Louvre in Paris both claim an authentic Leonardo da Vinci painting…”Our Lady of the Rocks.” The Louvre says, “OUR ‘Lady of the Rocks’ is painted entirely by Leonardo.” Scholars all agree this is TRUE. 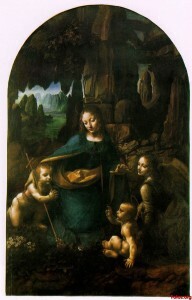 However, the National Gallery in London shouts the house down with “Yes, but Leonardo did some work on OUR ‘Lady of the Rocks,’ although painted 25 years later, so therefore it TOO is a Leonardo.” Some scholars disagree and are still debating whether Leonardo may or may not have added a few brush strokes to the National Gallery’s painting. Decide for yourself which is the “real” painting. 1. Leonardo’s genius was portraying real human emotions on his subjects faces. 2. Leonardo believed painting was a form of science and he invented a technique of blurring edges (sfumato) to produce mellowed colors and leave something to the imagination. No sharp edges. Take a look at the two paintings above. Which do you think is the “real” Leonardo? Both. 1485 was earlier, but our painter was not satisfied with his technique, while the painting was fading to black. So the 1506 version is clearer, but not quite up to pristine colors levels. Besides, sfumato is now here translated by airbrushing. He was quite an inventor, but at the beginning of the learning curve, and thence I’m leaving 1485 in the oops category! What? I love your blog. Each time I receive new information. My opinion is the first painting is the real painting, as the palette seems more da Vinci and there is more emotion. The second painting seems to stark for Da Vinci. I will vote for 1485 painting as the product of Leonardo. The facial highlights, the subtle margins are more in keeping with my understanding of his works. Guess we will find out the “true” Leonardo.